Did you know 80% of your immune system lives in your gut? That’s why including probiotics into your daily diet to balance your gut flora will boost your immunity in fighting against common bacterial infections. Eating fermented foods like miso, tempeh, yogurt, kefir, kimchi, sauerkraut is the easiest way to ensure optimal gut flora. Fermentation is the process of pre-digesting the sugar molecules of a food particle into gas, acid and alcohol by yeast and bacteria. Yielding a probiotic rich substance that offers plentiful of lactic bacteria that will harmonize your gut microflora. Contrary to common misconception, fermentation and pickling are actually two very different food processing methods. Pickling is the process of preserving the bounty of the season’s harvest by submerging food in an acidic medium, most commonly, vinegar. Fermentation is the process of metabolising the sugar molecules in food with salt, water, and a yeast/bacteria that produce it’s own self-preserving acidic liquid. So don’t get confused with pickled cabbage and fermented cabbage (eg. Sauerkraut). While they may be similar in taste, sauerkraut offers much more nutritional value than its overrated counterpart. 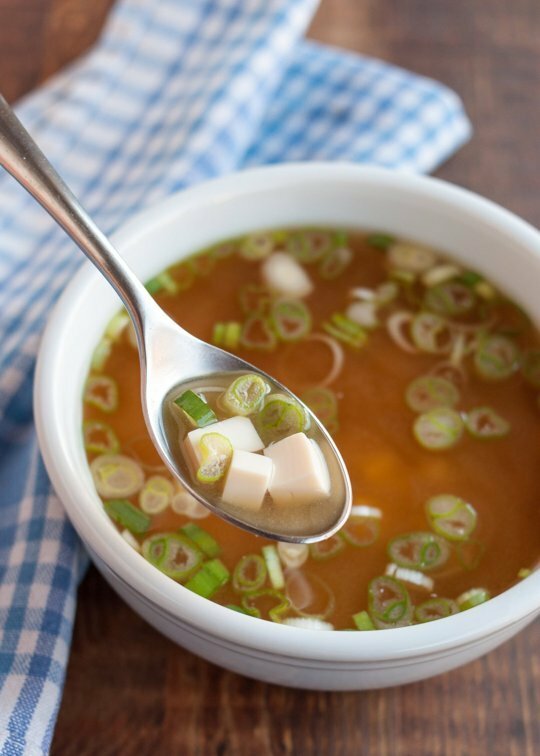 Check out the recipe for this Easy Probiotic Rich Miso Soup! Make the dashi: (See step-by-step instructions: How To Make Dashi):Combine the water and kombu in a 1-quart saucepan over medium heat. Remove the kombu just as the water starts to come to a boil. Add the bonito flakes, if using, and let the water come to a rapid simmer. Simmer for about 1 minute, then remove the pan from heat and let the bonito steep for an additional 5 minutes. Strain the bonito from the dashi. Add additional water if necessary to make 2 cups. Alternatively, substitute 2 cups water, chicken broth, or vegetable broth. Prepare the tofu and scallions: Cut the tofu into very small cubes, 1/4-inch to 1/2-inch on each side. Slice the scallions very thinly. Bring the broth to a rapid simmer: Pour the dashi or broth back into the saucepan and bring to a rapid simmer over medium-high heat. Mix the miso with 1/2 cup hot broth: Place the miso in a small ramekin or measuring cup. Scoop out about 1/2 cup of the broth and pour it over the miso. Whisk with a dinner fork or whisk until the miso is entirely dissolved in the water and no lumps remain. Pour the miso into the broth: Pour the dissolved miso into the simmering broth. Add the tofu: Reduce the heat to medium-low and add the tofu to the miso. Simmer just enough to warm the tofu, 1 to 2 minutes. Do not boil the miso once the tofu has been added. Add the scallions: Just before serving, scatter the scallions over the top of the soup. Serve in individual bowls: Pour the miso into individual bowls and serve. Miso is best when served fresh. It will settle a bit as it sits in the broth; whisk briefly with chopsticks or a spoon to mix the soup again.